Explore Washington Park and TriMet invite the public to take MAX Light Rail to ZooLights this weekend to enjoy live music 26 stories underground. Carolers dressed as fairy tale princesses will greet guests with holiday carols as they arrive at the Washington Park MAX Station, the deepest transit station in North America. In addition to live music, transit riders will see the exciting renovations underway at the station. The festivities continue above ground at TriMet’s Les AuCoin Plaza with a pop-up interactive light installation by Craig Winslow Studio, whose work has been highlighted at the Portland Winter Light Festival. This fusion of light projected onto the MAX station celebrates transit riders, the future of transit and the natural beauty of the Washington Park station. 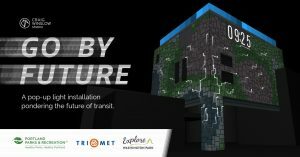 Transit riders can also participate in a free raffle to win a custom TriMet MAX Lego set, or a behind-the- scenes experience for two at the Oregon Zoo, a $240 value. The public can get their free raffle tickets from the Explore Washington Park customer service staff located next to the carolers in the MAX tunnel. The perks of taking transit don’t end there. Transit riders also receive $5 off ZooLights tickets purchased at the gate when they display proof of ridership. 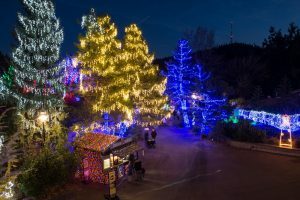 “With live music, an interactive light display, free prizes, and a $5 discount on admission, taking transit to ZooLights is the best way to kick off this holiday tradition,” says Explore Washington Park Executive Director Heather McCarey. The Washington Park Station is served by MAX Blue and Red lines. With a train arriving about every 8 minutes, transit riders can avoid the frustration and hassle of parking. ZooLights visitors who drive can also avoid the congestion by using the Sunset Transit Center Park & Ride. Located off of Highway 26 just two exits west of the Zoo exit, it is a short 7 minute train ride to the Zoo. Plan your trip in advance online or by calling TriMet Rider Support open from 7:30 a.m. to 5:30 p.m., every day. Strollers are welcome onboard TriMet buses and MAX trains but may need to be folded for safety. Children under age seven ride TriMet for free, and discounted Youth fare is available for those aged 7-17. Honored Citizen fare is available (with proof of eligibility) for riders 65+, Medicare recipients and people with disabilities. Hop Fastpass™ users: Remember to tap the reader at park-level before taking the elevator down to the Washington Park MAX Station. There is no Hop reader on the platform. Explore Washington Park started operating as a 501c3 in partnership with Portland Parks & Recreation in January 2014 to provide transportation management and information services to people visiting Washington Park—including the Oregon Zoo, Portland Children’s Museum, World Forestry Center, Hoyt Arboretum, Portland Japanese Garden, and International Rose Test Garden—with the goal of increasing access and visitor satisfaction. Explore Washington Park is primarily funded through paid parking revenues. ZooLights runs until January 7, 2018. ZooLights is closed December 24-25 and January 1-4. The zoo opens each day at 9:30 a.m., and ZooLights tickets are valid after 4 p.m. ZooLights hours are 5 p.m. to 9 p.m. Grounds remain open for one hour after gates close.